Leaving her research position was the start of Phyllis’ quest to prioritize her health and fitness. She began working as a flight attendant and did Weight Watchers to help her shed the pounds. With the weight finally gone, Phyllis started to run, starting with a half marathon in Kona in 2006. She did more half marathons and began working out with a fitness instructor. 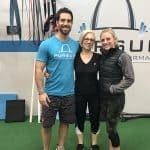 She liked her gym but found it to be geared more toward people in their 20s and 30s—not exactly the atmosphere she was looking for. She also noticed that the gym seemed to be more focused on money than on the wellbeing of its members. She needed a change. Favorite exercise: Anything that helps build muscle. I like muscle tone. Least favorite exercise: Lunges—because of my balance issues. Morning routine: I get up generally around 5:30 or 6. I have pets, so I feed them and then when I get to work, I have a V-8 a protein drink, coffee and a protein bar. I also take Dr. Josh Ax multi collagen and powdered greens. I try to do a lot of protein. I eat a lot of fish and seafood or sometimes chicken. Hobbies: I do animal rescue, primarily parrots and cats. I was one of the founders of Star Avian Rescue and was the president/board member of the Gateway Parrot Club. Currently, I own ten birds!